The Greater Glider is the largest of Australia’s gliding possums; head and body length is 35 - 45 cm. It’s weight 900 - 1700gram. The tail is longer than the body at 45-60cm and very bushy. It is entirely silent. Breeding takes place from March till June, females produce one young that stays in the pouch for 3 - 4 months, after that the young will travel on mums back, for a further 3 months. They become independent at 9 months, but do not reach sexual maturity and breed until they are 2 years old. The colour can vary greatly from dark chocolate brown to almost white. This is not dependant on area, different colours can occur within the same area. 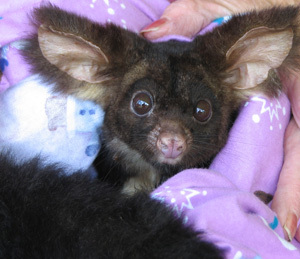 This glider lives in eucalypt forests, ranging from low open forest on the coast, low woodland west of the Dividing range to tall eucalypt forest in the ranges; it does not live in rainforest areas. The Greater Glider is strictly nocturnal, sleeping during daylight hours high up in tree hollows. It is not fast on the ground, it moves with a loping clumsy gait, but once in a tree it is extremely agile. 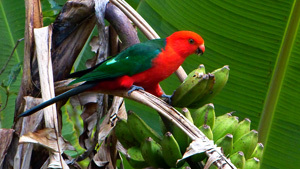 It feeds like the Koala, entirely on eucalypt leaves, the species of eucalypt vary greatly, but in one area it will only feed on one or two species. Like the ringtail possum and Koala it can grip on to a branch by opposing the first two toes of the forefoot to the other three, creating a pincer like grip. When gliding from tree to tree it flexes at the elbow and brings the paws under the chin, as the patagium (gliding membrane) extends only to the elbow, and not the wrist like most other gliders. It can cover a horizontal distance of up to 100 meters, and can change direction of up to 90 degrees whilst gliding, using the long tail to steer, and altering the curvature of the gliding membrane on either side of its body. As it comes in to land on a tree it swoops upward and stalls, with feet and claws extended to grasp the trunk. Scratch marks on the tree trunks can sometimes be tell tale sign of these gliders being around. They require a large hollow in which to build their nest. Tree hollows normally take up to 200 years to form, for a large hollow big enough to accommodate an animal this size, a tree would have to be about 400 years old. One has to wonder if these animals will still be around in the future with the destruction of old growth forest currently taking place. For them to survive, forest management, which retains buffer strips and protects old habitat trees, is essential. What happens on private property is equally important for the survival of our native animals, gliders like these would certainly be living on many privately owned properties, and it is up to us to make sure we do not cut down those old trees, as many species depend on them for their survival now and into the future. Even if we replant, the time frame for hollows to form, is much too great. Predators include The Powerful owl, dogs, foxes, dingo and off course our motor vehicles. The Australian Museum Complete book of Australian mammals. The Encyclopaedia of Australian Mammals by Ronald Strahan.